WASHINGTON, DC, November 20, 2015 (ENS) – Over the objections of millions of Americans, the U.S. Food and Drug Administration has approved a genetically engineered animal food. 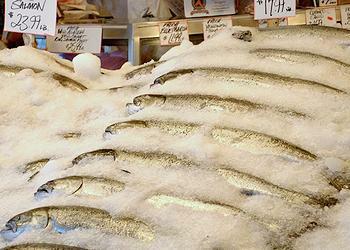 Atlantic salmon engineered for faster than normal growth was approved by the agency for sale, no label required. “The FDA has thoroughly analyzed and evaluated the data and information submitted by AquaBounty Technologies regarding AquAdvantage Salmon and determined that they have met the regulatory requirements for approval, including that food from the fish is safe to eat,” said Bernadette Dunham, DVM, PhD, director of the FDA’s Center for Veterinary Medicine. Made public Thursday, the approval has already drawn threats of a lawsuit and vows not to sell the AquaBounty salmon by thousands of grocery stores nationwide. More than 60 grocery chains, including Safeway, Kroger, Trader Joe’s and Target, with more than 9,000 stores across the United States, have made commitments to not sell this fish, dubbed “frankenfish” by its opponents such as Friends of the Earth. A growth hormone-regulating gene from a Pacific Chinook salmon and a promoter from an ocean pout were added to the Atlantic salmon’s 40,000 genes. These genes enable the farmed salmon to grow year-round instead of only during spring and summer. The purpose of the genetic modifications is to grow the fish to market size in 16 to 18 months rather than three years. Based in Maynard, Massachusetts, publicly-traded AquaBounty Technologies is a biotechnology company focused on “enhancing productivity in aquaculture,” and a majority-owned subsidiary of Intrexon Corporation. “Using land-based aquaculture systems, this rich source of protein and other nutrients can be farmed close to major consumer markets in a more sustainable manner,” Stotish said. The company says that land-based aquaculture systems can provide a continuous supply of fresh, safe, traceable, and sustainable AquAdvantage Salmon to communities across the United States and do it with a reduced carbon footprint. 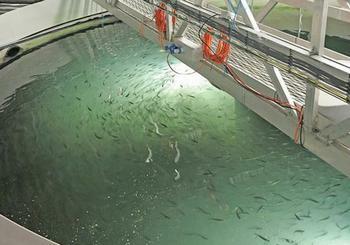 “It offers an alternative approach to fish farming that does not exploit the oceans,” says the company. “The data demonstrated that the inserted genes remained stable over several generations of fish, that food from the genetically engineered salmon is safe to eat by humans and animals, that the genetic engineering is safe for the fish, and the salmon meets the sponsor’s claim about faster growth,” the FDA said in a statement. “That’s because the multiple containment measures the company will use in the land-based facilities in Panama and Canada make it extremely unlikely that the fish could escape and establish themselves in the wild,” the agency stated. The FDA said that although it is not requiring labeling, food manufacturers are free to label the GMO salmon if they wish. for labeling of food derived from Atlantic salmon that has or has not been genetically engineered and a final guidance for labeling of food that has or has not been derived from genetically engineered plants. “Both guidance documents explain FDA’s best thinking on how to make it easy for consumers to know whether a food was produced using genetic engineering or not,” says Felicia Billingslea, BS, MS, director of FDA’s Division of Food Labeling and Standards. The public is invited to provide comments on this draft guidance. Starting November 23, comments can be submitted at Regulations.gov. The agency is sure to receive some blistering comments. “The FDA is supposed to protect public safety, yet the agency’s environmental review was done in the form of an environmental assessment instead of a more thorough environmental impact statement that would fully consider the threat this controversial new fish could pose to wild fish populations and ecosystems,” said Wenonah Hauter, executive director, Food & Water Watch, based in Washington, DC. “Food & Water Watch will be examining all options to stop this controversial and unnecessary GMO fish from reaching the marketplace. We urge President Obama to overturn FDA’s approval and stop GMO salmon from reaching consumers’ dinner plates,” said Hauter. “FDA’s decision also disregards AquaBounty’s disastrous environmental record, which greatly raises the stakes for an environmentally damaging escape of GMO salmon,” said Hauter. AquaBounty facilities outside the United States have dealt with an accidental disease outbreak, an accident that led to “lost” salmon, and a $9,500 fine from Panamanian regulators who found the company in breach of their environmental laws. In October 2014, officials in Panama penalized the local AquaBounty facility for failing to obtain necessary water use and pollution permits. The authorities said the company had “repeatedly violated” these regulations, and stated that these problems persisted from 2012 into 2013. AquaBounty Technologies said that Panama’s concerns were administrative in nature. Another problem could arise if genetically modified Atlantic salmon were to escape from captivity. They could succeed in breeding and passing their genes into the wild, Canadian researchers have found, a potential risk that FDA never addressed in its risk assessment. Dr. Darek Moreau, from the Memorial University of Newfoundland, published a study in July 2011 finding that genetically engineered Atlantic salmon can cross-breed with brown trout, a related species common to areas surrounding both AquaBounty facilities, in Panama and Canada. On November 17, Canadian environmental groups went to court to challenge the federal government’s approval of an application to manufacture genetically-modified salmon eggs in the province of Prince Edward Island. The eggs would then be shipped to Panama for grow out before being sold as food in North America. Ecojustice lawyers, on behalf of Living Oceans Society and the Ecology Action Centre, argued that the Canadian government acted unlawfully when it approved AquaBounty Canada Inc.’s application to manufacture genetically-modified salmon without adequate public notice and without adequate assessment for its other uses. The groups seek a court order overturning the approval. “Canadians expect government decision-making to be open and transparent, especially when it comes to something as significant as manufacturing genetically-modified salmon that may pose serious risks to wild Atlantic salmon stocks,” said Ecojustice lawyer Kaitlyn Mitchell. Back in the United States, Andrew Kimbrell, executive director of the Washington, DC-based Center for Food Safety, said his nonprofit plans to sue the FDA in coordination with other plaintiffs. “FDA has neglected its responsibility to protect the public,” said Kimbrell. In approving the AquaBounty transgenic salmon, FDA ignored millions of Americans and more than 40 members of Congress who have voiced their opposition. FDA also neglects the concerns of more than 300 environmental, consumer, health and animal welfare organizations, salmon and fishing groups and associations, food companies, chefs and restaurants. Some two million people filed public comments with the FDA in opposition to this action, the largest number of comments the FDA has ever received on an action.